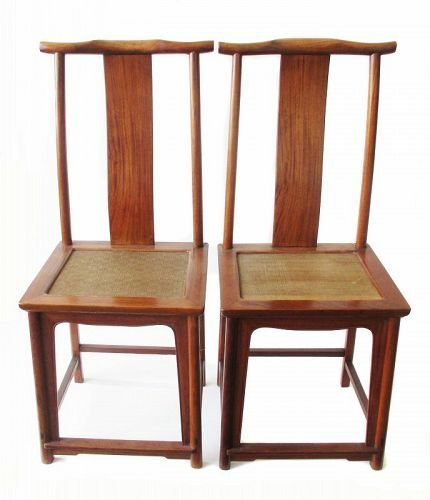 Antique pair of Chinese official's hat arm chairs, made of huanghuali wood with intricately woven rattan seats. Carved cusped edged apron. Dramatic grain. Provenance: From the collection of the Santa Barbara Museum. Dimensions: 44" high x 18 7/8" wide x 17" deep. Seat: 20 1/2" high. Japanese hardwood platform shelf for a tokonoma, a recessed art display area for a traditional tea ceremony room. Made with bold Keyaki (elm) hardwood with original dark lacquer finish. Original condition. 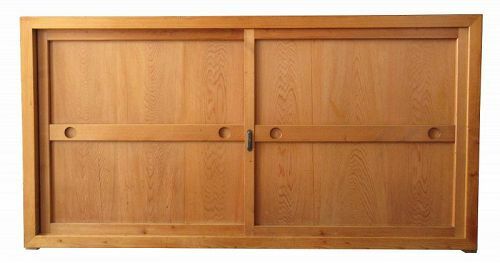 Japanese large half section Mizuya, or kitchen buffet tansu, constructed of Hinoki wood frame and Sugi wood panels. The large pair of sliding doors open to the spacious interior with two removable shelves straight across. The sides of the chest have horizontal bracing slats for reinforcement. 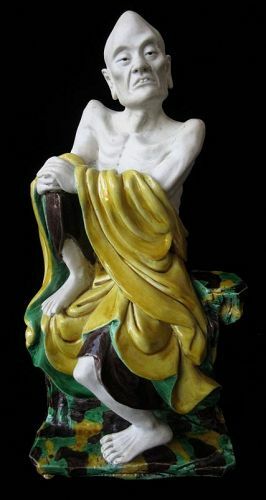 Chinese porcelain figure of a seated Daoist monk. The monk's skin is left unglazed, his draping robes and seat with Sancai "three colors" of yellow, green, and dark purple underglazes. One of the figure's ears is pierced through for gas to escape during kiln firing. 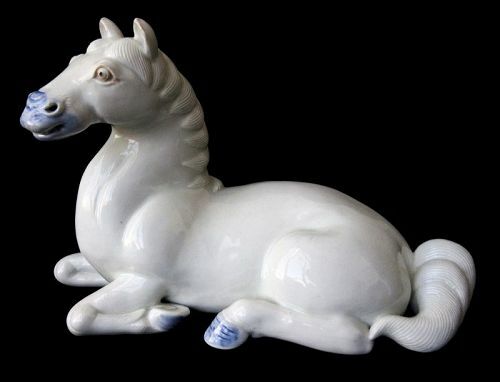 A fine Japanese hirado porcelain okimono of a recumbent horse. The horse has a whimsical expression. Its eyes are left unglazed with blackened pupils, its unglazed teeth exposed in a wide grin, the corners of the mouth and nostrils pierced through. Touches of cobalt blue underglaze accent the hooves and snout of the horse. The base is impressed with maker's cartouche. 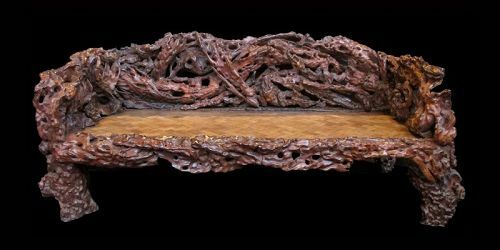 Chinese antique luohan day bed, made of zitan hardwood with rattan seat. Arms and back carved in key fret motif. Wide arching legs. Dimensions: 30 3/4" high x 82" wide x 39" deep. 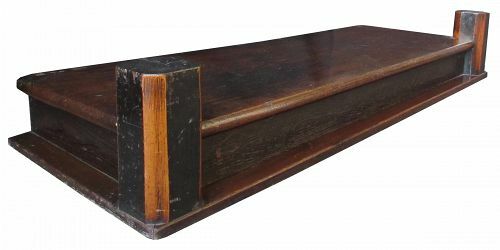 Seat: 17 1/2" high x 76 1/4" wide x 35" deep. 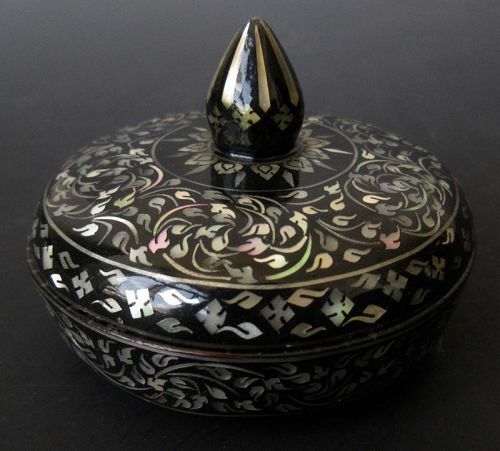 Korean round lacquered container with shell inlay motifs of scrolling vines and lotus petals. The lid is topped with a pointed finial, lifting away to the red lacquered interior. The base is black lacquer with inlay sides and delicate inlay along interior rim. 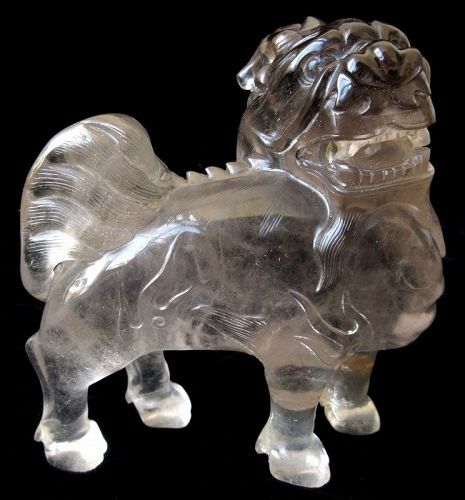 A Chinese rock crystal carving of a mythical beast called a Qilin. Resembling a fu dog, the creature is a chimera mixed with a lion, a deer, a dragon, and sometimes other animals. The Qilin is said to appear with the arrival and the passing of a sage or high ruler. 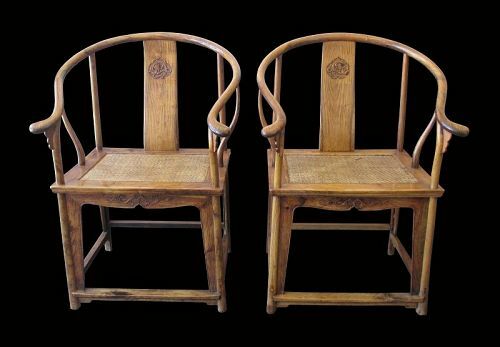 Chinese pair of horseshoe back arm chairs, made of huanghuali wood. The back splat is carved with a chimera and the front apron is carved with a scrolling vine motif. Dramatic grain patterning and rattan seats. Dimensions: 39 1/2" high x 27" wide x 25" deep. Seat is 20" high.